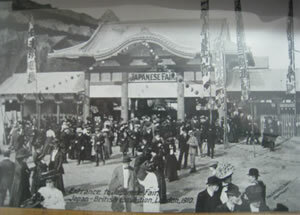 In 1910, exactly 100 years ago, The Japan-British Exhibition was held at White City in West London and was visited by over 8 million people. It was an occasion to celebrate the on-going Anglo-Japanese Alliance, which was signed in 1902, and lasted for twenty years. An exhibition to celebrate the centenary of the Exhibition will take place at the Museum of Fulham Palace between 17 July and 19 September 2010. 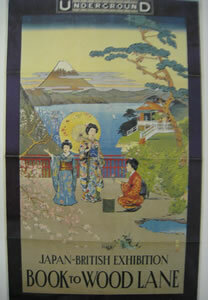 The exhibition will include many photographs of the Japan-British Exhibition, as well as commemorative china, guidebooks, the Official Report of the Exhibition and Japanese prints and artefacts. Among the items on display will be the birth certificate of the baby born to parents working in the Ainu Home, one of three replica Japanese villages on the site. Although the idea initially came from Imre Kiralfy, a London entrepreneur, its Japanese promoter was the then Foreign Minister, Komura Jutaro. Almost half of the exhibits were provided by government departments, projecting a message to the British public, that emphasised Japan as a modern civilised nation and displayed the Post Office, the Red Cross and 12 historical tableaux to show Japan's long history. To show that Japan was an imperial power, just as Britain was, displays from her colonies and the Ainu and Taiwanese aborigines were also brought over. In order to promote Japan as a peace-loving nation, numerous rare and high quality retrospective arts and elaborate traditional architecture models were exhibited and two authentic Japanese gardens were created at the site. At the same time, in order to promote trade, Japanese products and goods, including crafts, from many companies and artisans were exhibited. Many accompanying books, leaflets and catalogues were also published. To date, such a magnitude of displays has never been repeated outside Japan. To re-assess the significance of the 1910 Exhibition and to mark its centenary, many events have been planned for throughout 2010, some of which have already been held successfully. On 23 May, a festival was held at the renovated original Japanese garden, the only remaining sign of the exhibition at the 140 acre site. In fact, descendants of an artisan who participated in 1910 came to see the very site. In mid-June, a whole day symposium was held at LSE, followed by a seminar at the Japan Foundation. As for forthcoming events, a history panel will be held at BAJS conference in September and another symposium will follow in Tokyo in October.